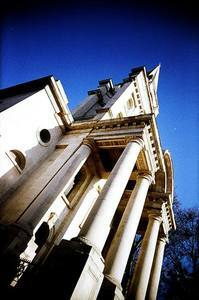 Take a guided tour of the London churches of Nicholas Hawksmoor on Tuesday 31 May. Hawksmoor's baroque churches are striking sacred landmarks that generally inspire awe with their cool white Portland limestone, soaring spires and unusual design. This day tour takes you to St Alfege, Greenwich, St Mary Woolnoth, Christ Church Spitalfields and St George, Bloomsbury, tripping past St Anne Limehouse and St George Bloomsbury as well. The walk is led by architectural historian Owen Hopkins, who leads tours for the Royal Academy among others. He's a specialist in eighteenth century British architecture and you can peruse his scholarly credentials online. The cost of the day is £25 but it's a full on tour, beginning at 10.30am at London Bridge City Pier, cruising down the Thames to Greenwich and ending at approximately 4pm in Bloomsbury, near Holborn Station. The ticket price includes a 25-page illustrated handout and reading list and access to Mr Hopkins' brain. Looking at his photo we're convincing ourselves he's 18th century architecture's own Professor Brian Cox and probably worth it. P.S. We recommend you read Peter Ackroyd's novel Hawksmoor before you go, if you haven't already.